Each birth is so unique, but I love how in all of them things have a way of working out, even if it isn't always how we had planned. This is a precious story with a mom who gets a great birth surrounded by those who love her. When Chris and I started the discussion of having children, the type of birth we wanted had to be explored a bit. After researching online, watching some birth documentaries, etc. we both agreed that having a natural child birth was very important to us. Making this happen would take more research. I decided contacting some local midwives to explore the idea of a home birth would help with the decision process. We met with Lynnette, our midwife, and Chris and I felt she was the right choice for us. I went to my local OBGYN to get my 8 week ultrasound done and they informed us the due date was 01/04/11. The rest of us predicted a due date of around 12/27 or 12/28; due to my ovulation schedule and the husband being home. On 12/17/10, I moved out to our new house in Yuma. Not finished, but mostly cosmetic work left to be done. My parents were coming in to visit before the birth and to be there just in case Chris wasn't home when I went in to labor. Lucky me they got into the car on Saturday and not any later. Sunday morning about 1am I woke up, because well I felt I wet myself and then it was like I couldn't control my bladder and would just go on occasion before making it to the bathroom. I chalked this up to uncontrollable urination which some women get in late pregnancy. On Sunday afternoon my parents arrived in town. They were exhausted so they headed to bed around 8:00 that evening. I had been explaining to my mum I was having some lower back pain about this time. About a half hour after they went to bed I started having contractions, but wasn't sure. At 11pm I called Lynnette and she said they were definitely contractions and to contact her when they were 5 minutes apart. To try to rest in the meantime, since our baby boy would be coming into the world soon. So sleep, well didn't get much, between contractions and anticipation it wasn't happening. Then the nerves were kicking in because Chris was on his way to Delaware and wouldn't be home until Thursday. Monday morning when my mum and dad got up, I informed them I was having contractions and they were 7 minutes apart. Lynnette contacted me in the morning on her way to another home birth; after this birth she was going to be heading to me. When my contractions got closer together she called Whitney (Midwife Assistant/Midwife in Training) to get there before her to assist me in the meantime. At this point I was getting tired and the contractions were starting to hurt more so I was excited Whitney arrived for some additional support. I kept thinking to myself about all the books I read to prepare me for this. Kept thinking relax and breathe through the contractions. Talking or making noises only exhausted me more, so I just kept with the breathing and relaxing. I would rest in the hot bath tub to help relieve some of the pain or lay down/sit down with a heating pad. Food was the last thing on my mind, but I knew I needed it. When I felt weak I would inform Whitney and her or my mum would get me a snack. When Lynnette arrived that early evening they did a check to see how far dilated I was and they were shocked when they found out I was 7cm. They thought I had been so quiet that they were guessing 4cm maybe 5, but not 7cm. The contractions were closer and stronger. Then the contractions were forcing me to push. It was time to get checked out again and yep I was crowning. On to the bed I went. I got on my knees and rested my arms and head on the headboard. Whitney or my Mum, not really sure, called Chris and got him on speaker phone for the birth. All that reading came in handy. Remembering only to push during the contractions and rest in between, unless instructed otherwise. Did it hurt? Of course it hurt, but I knew the pain was manageable if I focused on what it was achieving the birth of our son. His head was out. Now I heard Lynette yelling to push between the contractions because the cord was around is neck (not wrapped, but still around). Lynnette had to help pull him out the rest of the way since they were concerned about how the cord was. He was pale; I heard him cry. Lynnette was concerned that he hadn't taken that big breathe to release all the fluids, so she grabbed the oxygen puffer (I am sure there is a techinical name for this, but I don't know it), his heart was beating and he was breathing, he just needed a little help to get that big breathe taken. Henry then was crying...loud. This was an amazing experience that one can hardly find words to describe. Immediately after Henry let out that big cry he was put on my chest for me to hold. I was able to look into his eyes, tell him I love him and got to look at his big eyes get lost in mine. This was incredible bonding time. After a while it was time for him to be checked out and the cord cut. Since Chris wasn't home to cut the cord my mother got the honor. I think she was really happy that she got to do this. After we were both cleaned up it was time to just lay together some more. He is a normal healthy baby boy and absolutely amazing. Henry Russell St.Peter was born on Monday, 12/20/10 at 10:03pm 7lbs 7oz 20 inches long. 25-26 hours of contractions and our little miracle was here. 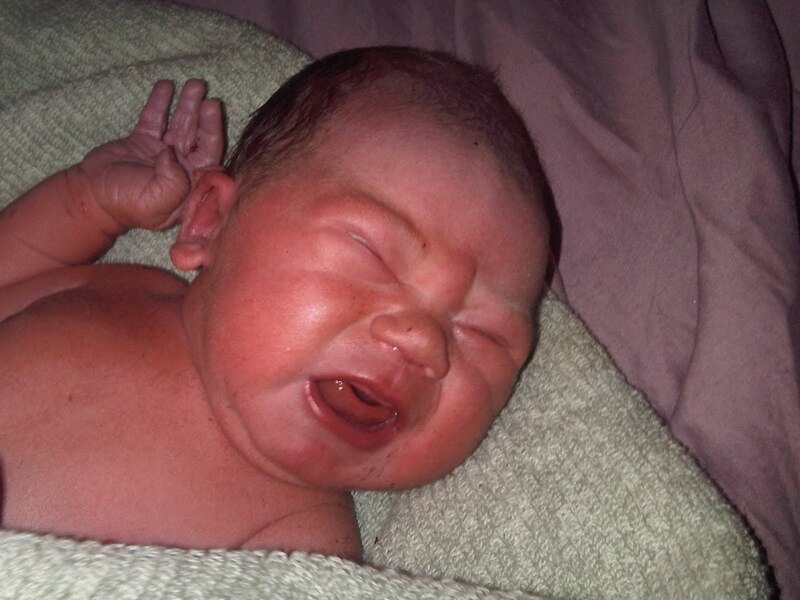 All births can be a scary no matter where you chose to have your baby. 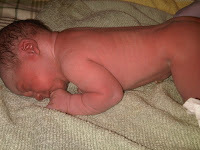 I was fortunate enough to find a midwife with a good team, with a lot of experience to help me have the birth I wanted. My mum asked me the next day, when you get pregnant again will you do another home birth? YES, of course. I got the birth I wanted and was able to do it at my pace in my home. The only thing I would change is having my husband there. 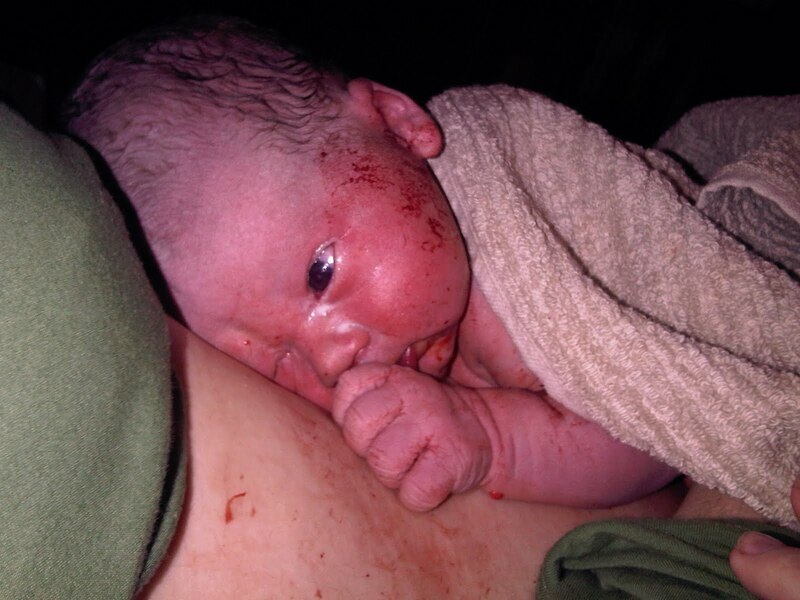 I would recommend all mothers to be to consider a natural childbirth, whether at home or in a hospital. It a truly rewarding feeling. Trust your body, it was built to give birth. I highly recommend reading a Guide to Childbirth by Ina May Gaskin; great book with a lot of helpful information. This will be an experience I will never forget, it was a proud day for me and a truly blessed day for Chris and I. Hope you all enjoyed reading about the birth of our son and like the pictures. A big thanks to Mum and Dad for all their support during and after the birth. Also to Lynnette and Whitney helping me have the birth I wanted and delivering our son. And of course to my most amazing husband, couldn't of done this without you.